The facade of downtown Oak Park has evolved in recent years, and last week the new face of the business organization by the same name set foot on the job. The Downtown Oak Park business association has selected its new executive director. Max Williams, who is serving in the same position for the Downtown Wheaton Association, will fill the position of Pat Zubak who retired in August. After seven years in the position, Pat Zubak, executive director of the Downtown Oak Park business association, announced July 10 that she'll retire in August. Zubak, who has been in the position since 2005, sent an email to friends and colleagues about her decision, explaining why she's moving on. 5 Reasons to come to Art dans la Rue on Tuesday, August 2nd! See what's in store this month at Thursday Night Out! Thursday Night Out is BACK and taking on NEW heights this season! Oak Park's biggest ongoing food festival runs every Thursday Night through the summer. Enjoy 4-star shopping minutes from Chicago and adjacent to the world-renowned Frank Lloyd Wright Historic District. "If Oak Park's buildings are a feast for the eyes, it's commercial districts offer a true banquet, with little bakeries, lively ethnic joints, and fine dining establishments. . . MMMM"--Chicago Magazine. Downtown Oak Park offers an exceptional array of shops, restaurants, a state of the art seven-screen movie theater and an exciting year-round schedule of promotions and special events. Add the convenience of numerous professional and personal service businesses, our central location, a public transportation center and plenty of parking--and you have a downtown experience that is unsurpassed! Located right off I-290, or at the Harlem stop on the CTA Greenline, and at the Oak Park stop on the Metra Union Pacific West Line, Downtown Oak Park is readily accessible. 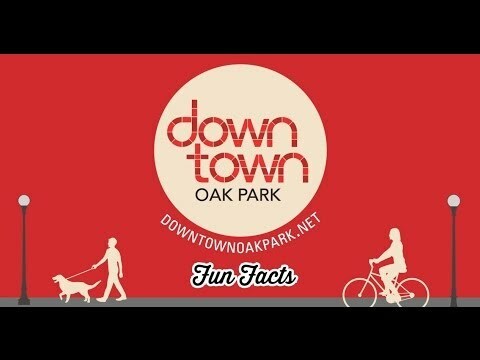 Visit our webiste at www.downtownoakpark.net for an up-to-date events calendar or to buy gift certificates for the Downtown Oak Park shops--over 75 of the most eclectic, interesting stores in the area. For some reason the official link for Downtown Oak Park is not working: the website is not there, just some vague site saying the domain has just been registered.